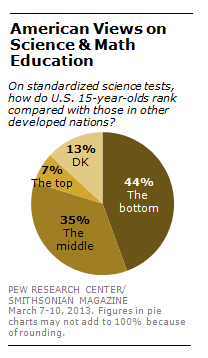 A plurality of Americans (44%) say that average American 15-year-olds rank at the bottom on standardized tests of science knowledge, when compared with students in other developed nations, according to a Pew Research Center survey conducted in March. But that is incorrect: According to the most recent available data from the Program for International Student Assessment, U.S. students rank among the middle of OECD nations (Organization for Economic Co-operation and Development). The survey finds that 35% correctly know that U.S. 15-year-olds are about in the middle when it comes to science knowledge; 7% say incorrectly that American students rank among the top of developed nations. The survey asked an open-ended question about what one subject K-12 schools should emphasize more these days; 30% of respondents say math; 19% say English, grammar or writing, while 11% say science; and 10% say history, social studies or government. Overall, 45% mention some aspect of science, technology, engineering or mathematics. (This survey reflected the results of a nationwide quiz on science and technology. Take the 13-question quiz and see how your score compares to others).